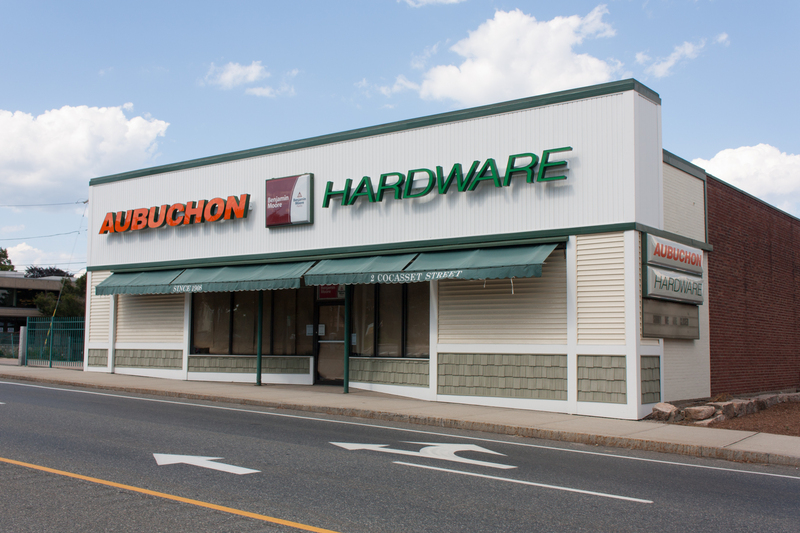 Last Friday, July 22, Aubuchon Hardware Corporate came to the Foxboro store and told everyone it was their last day and the store was closed. The town of Foxboro is poorer because of it. It is a fact that businesses come and go. No matter where you live, we all have seen businesses last for generations, and some last only a year or two. It is the nature of the corporate industry, economics, and a fact of life since people started opening shops hundreds of years ago. It is also a fact that in this country, larger businesses tend to swallow up the small businesses. The big box stores tend to put the smaller companies out of business. This is true of small grocery stores (too many to name), book stores, restaurants, and specialty stores. Seemingly untouchable businesses – cornerstones for generations —gone. When I was a kid – we went to the neighborhood stores. So did you. You saved the BIG shopping trips for the “giant” stores of the day: Kresgee/K-Mart, Bradlees, Woolworths, Zayres, Lechmere, and many others. Younger readers won’t even recognize the names of those department stores – they have long since faded to memory, replaced by bigger, cookie-cutter box stores. Now, I’m not lamenting the state of American business. The World Wide Web, Amazon.com and online shopping have forever altered – for good or bad – the way we shop. When was the last time you went to a STORE to buy a CD? When was the last time you needed to go to RadioShack? Even smaller MALLS have to either upgrade or they fade into ghost towns (the old mall in North Conway comes to mind). It is a fact that a business – any business — will only last so long until it is replaced by something bigger or more convenient. That is capitalism, progress, the way we shop, that is the way it is. Always has been. It’s sad, yes, but it’s the way it is. All that said, there is something to be said for the NEED for small businesses like Aubuchon hardware. I told them many times there that unless I needed 100 sheets of plywood, I wasn’t going to Home Depot or Lowe’s – I would be coming to Aubuchon. I am also not disparaging Home Depot or Lowe’s – but they don’t have the feeling of community and friendship that a small business like Aubuchon Hardware did. They never can. See, this is not simple nostalgia of the good old days when all stores were small mom-and-pop shops. It’s the loss of something much more important – a store that is also a place of community and true customer service. Like other small businesses forced out, Aubuchon – a 65 year Foxboro institution – was a place that had EVERYTHING. Sure, a little more expensive than the depot (by economic necessity) – but worth it. Do you know how hard it is to get a key made at Home Depot? Do you know how difficult it is to find a person who will explain to you how to repair something at Lowe’s? There were COUNTLESS times I went to Aubuchon – and Angie, or one of the kids (I call them all kids!) or store manager Allain Mongeon – would smile, say hello, listen to my question, and then answer it. I am not very mechanically inclined – my specialty is computers – so when I went in with a plumbing question, a question about what kind of paint to buy, what insulation might be best for the winter, or my famous, “I need a thing I don’t know the name of it but it’s this shape and it’s for a dishwasher” and someone at Aubuchon Hardware would smile and tell me the name of that item and walk me over to the aisle and show me the different types and how they worked – well, it was always so appreciated. Several months after I painted my kitchen, I stopped in and Suzanne asked me how the kitchen came out. I often saw an employee talking in detail to a customer, explaining how to do something. I often saw them taking time with one customer to find just the right part for something, or looking it up where the customer could find it. Countless times an Aubuchon employee carried a big bag of soil or rock salt or heavy object into someone’s car. The store gave community organizations like the Jaycees a small discount – that was also so much appreciated. A few months back I told one of the employees the squirrels were eating the food I put out for wild birds. “You need a baffle,” I was told, and led to a piece of Frisbee-shaped plastic that did the trick and keep the squirrels away from the birdie food. I loved that about Aubuchon. There was a sense of community and family there. Need something you can only describe? They knew what it was, its actual name, and had it in stock. Need one piece of glass specialty cut? No problem. Need a weird looking nail or screw that no one else had? They’d take ten minutes and find it for you. Every time. You needed it, they had it — ANYTHING you needed for your home repair project. They greeted you by name, always with a smile and made you feel like you were the only customer that mattered during your transaction. This was a place on Saturday morning where you would run into your neighbor – you could chat about what home project they were working on while you explained what you were working on. I never left that store without what I needed to buy. Someone ALWAYS helped me. And more often than not we had had a good conversation. Allain – who also has a parrot like mine – and I often shared stories about our birds, the best way to care for them, our individual horror stories when they would act like little children, and shared laughs over how fascinating they are. He is more than a store manager – he became a friend to many of us in town. And Angie – I remember a few years ago saying how good the store looked at Christmas time – it was Angie who took all the time to put up the lights and the decorations. She always recognized the puzzled look on a customer’s face and would come right over, smile and say can I help you? They were all like that – helpful, friendly, the epitome of good customer service and COMMUNITY. Over 65 years, think of all the kids in Foxboro who worked there part time and all they learned – not just about hardware – but about working in an environment of true community and customer service. I will wager that most of them left the experience better than when they arrived. I liked all of the kids who worked there. I would ask them how school is going, how spring break went, what was happening in their lives – because those were great conversations and it was nice to get to know them on a human level. Again, it is the reality of business in this day and age that the small stores will eventually close or be gobbled up by the bigger businesses. It’s awful, it’s also the way it is. But I would like to say this to COPORORATE Aubuchon: You have made a terrible mistake closing Aubuchon Hardware in Foxboro. I am very sure the decision was not personal but financial and you had your reasons. But you have made a dreadful decision and robbed this community of one of your best stores, a place people loved to go to, a place of excellent customer service, a place where if they didn’t have it they would order it for us – one of the last remaining “community” businesses that was truly a family for so many of us for 65 years. Another piece of Foxboro has been taken away. And downtown becomes a little more desolate than it already is. It’s a shame. 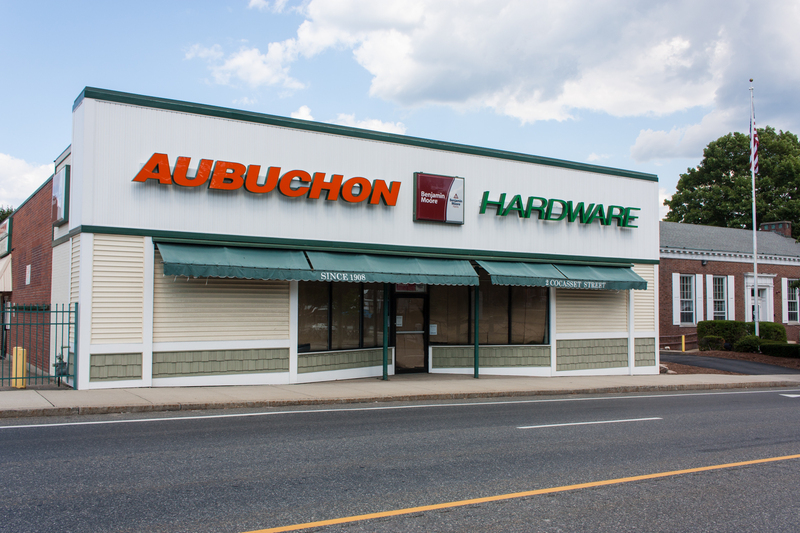 To everyone who ever worked at Aubuchon – and especially to Allain, Angie and Suzanne, Conner, Brendan – and everyone who came before — please know you made a difference here and contributed not only a great hardware store but a place that enriched this community and brought people together. We wish you every success and we will miss you terribly. 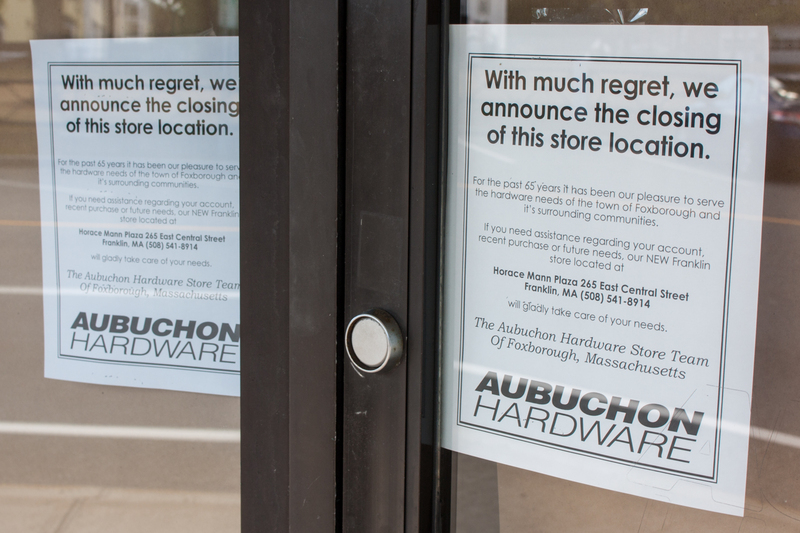 Aubuchon Hardware of Foxboro has closed. We as a community are poorer because of it. End of Summer 2016: Thoughts on a variety of topics → ← Pulse massacre in Orlando – another senseless shooting, and more tweets of thoughts and prayers – It’s time to DO something.